It was a sign of the sixties. Drawn by the promise of spiritual and creative freedom, thousands of women from white middle-class homes rejected the suburban domesticity of their mothers to adopt lifestyles more like those of their great-grandmothers. They eagerly learned "new" skills, from composting to quilting, as they took up the decade's quest for self-realization. "Hippie women" have alternately been seen as earth mothers or love goddesses, virgins or vamps-images that have obscured the real complexity of their lives. Gretchen Lemke-Santangelo now takes readers back to Haight Ashbury and country communes to reveal how they experienced and shaped the counterculture. She draws on the personal recollections of women who were there—including such pivotal figures as Lenore Kendall, Diane DiPrima, and Carolyn Adams—to gain insight into what made counterculture women tick, how they lived their days, and how they envisioned their lives. This is the first book to focus specifically on women of the counterculture. It describes how gender was perceived within the movement, with women taking on much of the responsibility for sustaining communes. It also examines the lives of younger runaways and daughters who shared the lifestyle. And while it explores the search for self enlightenment at the core of the counterculture experience, it also recounts the problems faced by those who resisted the expectations of "free love" and discusses the sexism experienced by women in the arts. Lemke-Santangelo's work also extends our understanding of second-wave feminism. She argues that counterculture women, despite their embrace of traditional roles, claimed power by virtue of gender difference and revived an older agrarian ideal that assigned greater value to female productive labor. Perhaps most important, she shows how they used these values to move counterculture practices into the mainstream, helping transform middle-class attitudes toward everything from spirituality to childrearing to the environment. 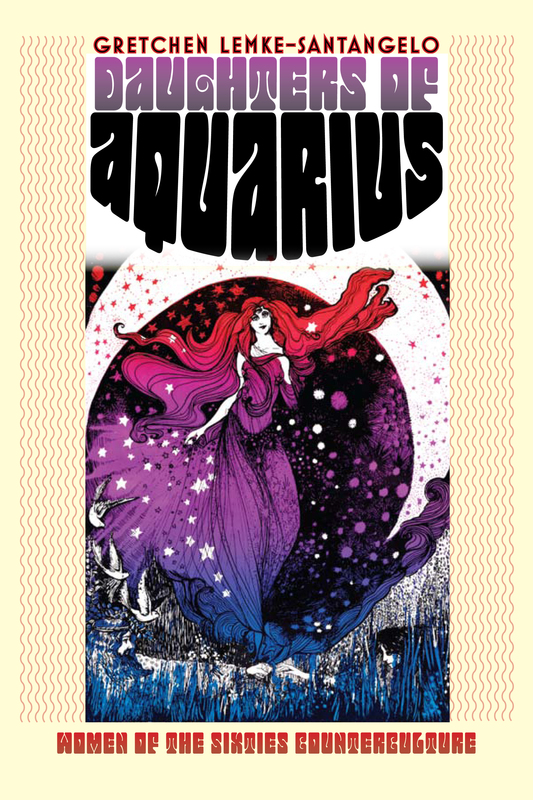 Featuring photographs and poster art that bring the era to life, Daughters of Aquarius provides both an inside look at a defining movement and a needed corrective to long-held stereotypes of the counterculture . For everyone who was part of that scene—or just wonders what it was like—this book offers a new perspective on those experiences and on cultural innovations that have affected all our lives. Gretchen Lemke-Santangelo is professor of history at St. Mary's College of California. She is author of Abiding Courage: African American Migrant Women in the East Bay Community and coauthor of Competing Visions: A History of California.